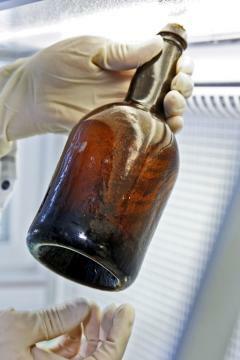 In 2010, divers exploring a Napoleonic-era wreck off the Åland islands, a Finnish (but autonomous, and Swedish-speaking) archipelago in the mid-Baltic, discovered bottles of champagne and beer that were still sealed and appeared intact. Some of the champagne was auctioned for charitable causes - raising €54,000 for just two bottles! - and a couple of the beer bottles were sent to Finland's VTT Technical Research Centre for analysis. The analyses also appear to show they were two different beers - one with some characteristics typical of wheat beer and the other much hoppier than the first, and with different bacterial compositions. A presentation given by VTT on the findings is available as a PDF here. They're going to sell some more of the champagne next month. The next step will presumably be to try recreating the beers - the Åland government is funding the research in a sort of PR exercise for the islands.